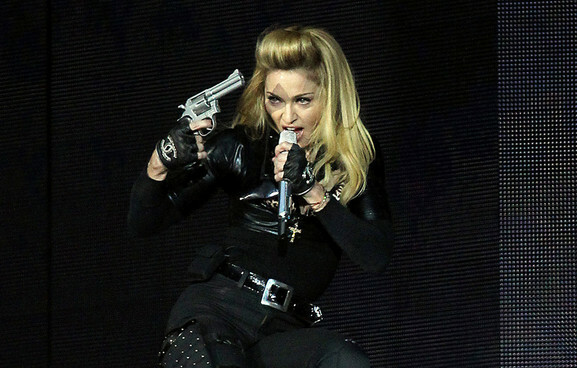 Madonna concerts in South America outsell rival Lady Gaga by three to one, according to latest statistics. The statistic is even more embarrassing to Gaga as Madonna's 'MDNA' tour tickets are also three times more expensive than briefs for her 'Born This Way' world tour. The Examiner reports that Lady Gaga's management used under-hand tactics, such as issuing buy-one-get-one-free deals to fans, in order to boost crowd numbers. The singer played in front of a crowd of 50,000 in Peru but only 17,000 tickets were sold. However, Madonna played in the same venues on the South American leg of her worldwide 'MDNA' tour and managed to sell-out the stadiums without having to resort to issuing incentives to raise numbers. The feuding pair have been at each others throats ever since Madonna claimed that Gaga's track 'Born This Way' sounded "familiar" to her 1989 hit 'Express Yourself'. Throughout this year's 'MDNA' tour, Madonna has mocked the similarities between the two songs by performing a mash-up of 'Express Yourself' and 'Born This Way' followed by a pointed snippet of a track called 'She's Not Me'. During a show in Atlantic City in September, Madonna dedicated her song 'Masterpiece' to Gaga, before saying: "I love her. I love her. I do love her. Imitation is the highest form of flattery." Last month, Madonna's famous conical bra was sold for $51,971 (£32,450) at auction. The iconic garment - which was made famous by the Queen of Pop during her 1990 Blonde Ambition tour - fetched twice its estimated price when it went under the hammer at a music memorabilia auction at Christie's.